Have you ever wanted to go on a bird walk? This Saturday, March 16th, bright and early at 8 a.m. there's a bird walk at Tanglewood Park outside of Winston-Salem's city limits. Tanglewood is a beautiful county park with nature trails, horseback riding and mountain biking trails. From the James Bond Cottage, it's about a 25 minute drive. I'm admittedly not a morning person, but I'm so tempted because this bird walk is looking for Great-horned and Barred Owls. There have been sightings at the park lately so the friendly folks at Wright's Birding Center are leading their monthly bird walk at Tanglewood. The owners, Sarah and Nathan lead a free bird walk usually on the last Saturday of every month (except December). Many of the monthly bird walks are at Reynolda Gardens, just 5 minutes from the cottage. So what do you bring on a bird walk? I'm fascinated by owls and at the guest cottages, we have a pair of owls in residence. I think I've figured what tree they nest in. And at night and in the early morning, we've heard their beautiful sounds. The guest in the Wimbledon Cottage, sent me a text, saying she could see the owl in the large oak tree behind the cottage. I jumped at the chance to see the owl and peered out the kitchen window trying to get a glimpse but it was too dark. I've listened to the calls of both on YouTube and based on the sounds, they're definitely Barred Owls with the Hoo-hoo-to-hoo-oo, hoo-hoo to wha-aa; it sounds a lot like "Who cooks for you? Who cooks for you all?" 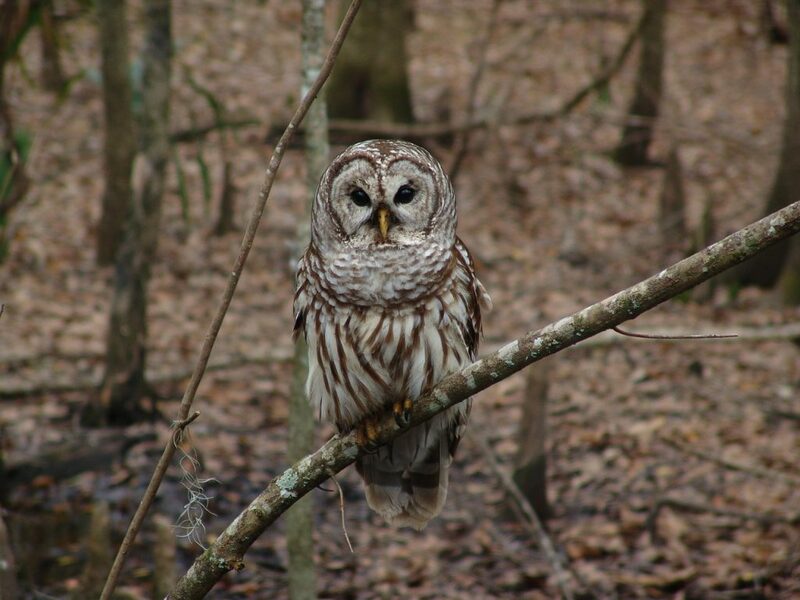 You can listen as Cornell Lab's Laura Erickson sets the scene for the Barred Owl calls. She says the sound is magical, and I have to totally agree.